The first batch of user-created missions in GTA Online is now live on all platforms, with the Rockstar seal of approval. The GTA Online content creation kit was released just two weeks ago, and in that time Rockstar's players have created over a million custom missions. Take a second to wrap your head around that number, then come back. With so much user-created content out there, it's going to get hard to find the really great ones - so Rockstar is doing the dirty work for you. 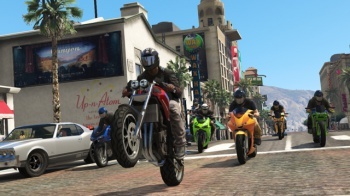 The initial batch of "Rockstar Verified" user-created jobs has been released, legitimizing 10 of the best custom missions. The package includes six races and four deathmatches, from a mountain obstacle course to a close-quarters brawl in the local prison. These jobs were pulled from both the PS3 and Xbox 360 versions of the game, and were previously only available to players with the same console as the creator. Now, though, they're official GTA Online content, playable on both consoles and distinguished with the Rockstar seal of approval. Rockstar will continue to appraise user-created jobs, with "many, many more" officially-endorsed jobs in the coming weeks and months. You can expect the custom content to get even more creative as players get familiar with the tools, too. If you'd prefer to look before you leap into the new content, you can get an overview on the ten Verified maps over on Rockstar's website.